I found this piece of film on youtube. Its a wonderful period piece shot in Australia that shows how EMI Australia recorded, manufactured and released a record in those days when vinyl ruled the world. I think that recording was made in EMI’s Studios 301 that is now part of Tom Meisner’s SAE empire. Can anybody confirm that? Please let me know if you think it was a different studio. The band in the film are The Australian Crawl. 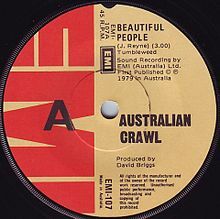 This was their first single on EMI called “Beautiful People” and it reached #22 in the Australian charts. they would go on to become the 4th most successful Aussie band on their domestic albums chart of all time by the mid-1980’s when they split up. This entry was posted in making a recording and tagged 1979, australia, EMI, emi australia, studios 301, the australian crawl, vinyl by Nipper. Bookmark the permalink.